RAID is Redundant Array of Inexpensive disks, used for high availability and reliability in large scale environments, where data need to be protected than normal use. Raid is just a collection of disks in a pool to become a logical volume and contains an array. A combine drivers makes an array or called as set of (group). RAID can be created, if there are minimum 2 number of disk connected to a raid controller and make a logical volume or more drives can be added in an array according to defined RAID Levels. Software Raid are available without using Physical hardware those are called as software raid. Software Raid will be named as Poor man raid. Main concept of using RAID is to save data from Single point of failure, means if we using a single disk to store the data and if it’s failed, then there is no chance of getting our data back, to stop the data loss we need a fault tolerance method. So, that we can use some collection of disk to form a RAID set. What is Stripe in RAID 0? Stripe is striping data across multiple disk at the same time by dividing the contents. Assume we have two disks and if we save content to logical volume it will be saved under both two physical disks by dividing the content. For better performance RAID 0 will be used, but we can’t get the data if one of the drive fails. So, it isn’t a good practice to use RAID 0. The only solution is to install operating system with RAID0 applied logical volumes to safe your important files. RAID 0 has High Performance. Zero Capacity Loss in RAID 0. No Space will be wasted. Zero Fault Tolerance ( Can’t get back the data if any one of disk fails). Write and Reading will be Excellent. 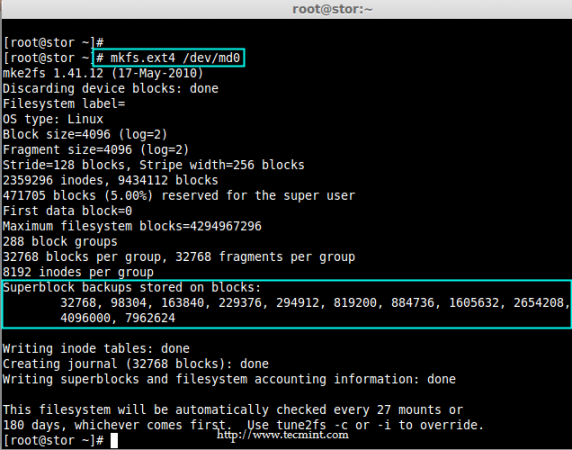 Minimum number of disks are allowed to create RAID 0 is 2, but you can add more disk but the order should be twice as 2, 4, 6, 8. If you have a Physical RAID card with enough ports, you can add more disks. Here we are not using a Hardware raid, this setup depends only on Software RAID. If we have a physical hardware raid card we can access it from it’s utility UI. Some motherboard by default in-build with RAID feature, there UI can be accessed using Ctrl+I keys. If you’re new to RAID setups, please read our earlier article, where we’ve covered some basic introduction of about RAID. 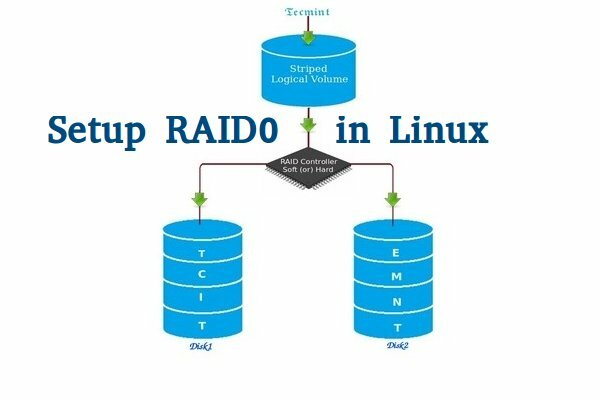 This article is Part 2 of a 9-tutorial RAID series, here in this part, we are going to see how we can create and setup Software RAID0 or striping in Linux systems or servers using two 20GB disks named sdb and sdc. 1. Before setting up RAID0 in Linux, let’s do a system update and then install ‘mdadm‘ package. 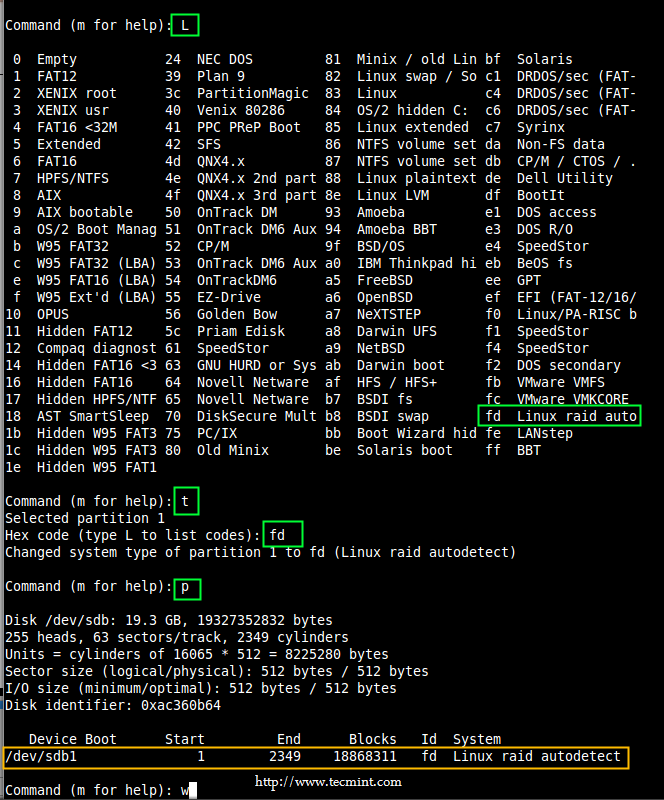 The mdadm is a small program, which will allow us to configure and manage RAID devices in Linux. 2. Before creating RAID 0, make sure to verify that the attached two hard drives are detected or not, using the following command. 3. 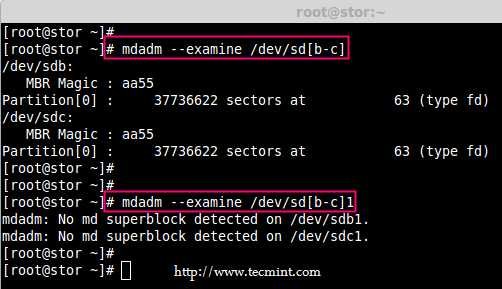 Once the new hard drives detected, it’s time to check whether the attached drives are already using any existing raid with the help of following ‘mdadm’ command. 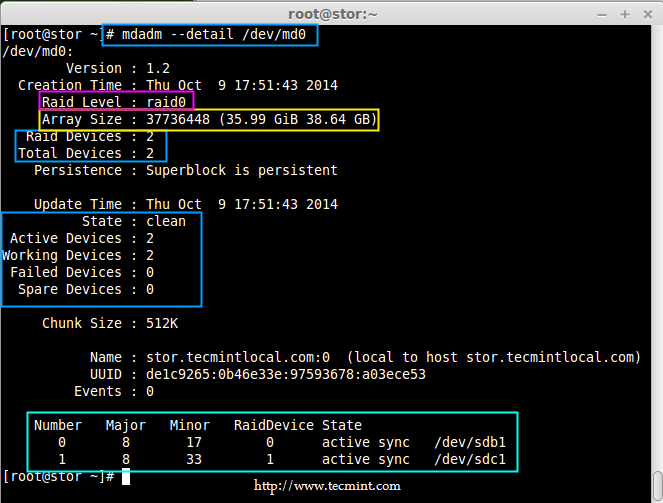 In the above output, we come to know that none of the RAID have been applied to these two sdb and sdc drives. 4. 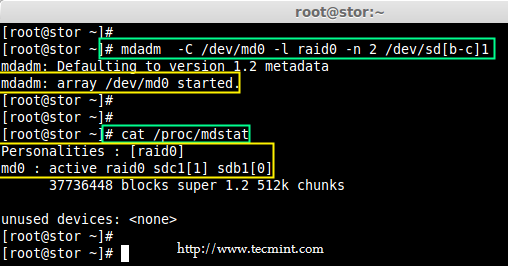 Now create sdb and sdc partitions for raid, with the help of following fdisk command. Here, I will show how to create partition on sdb drive. Follow below instructions for creating partitions. Give the default value by just pressing two times Enter key. 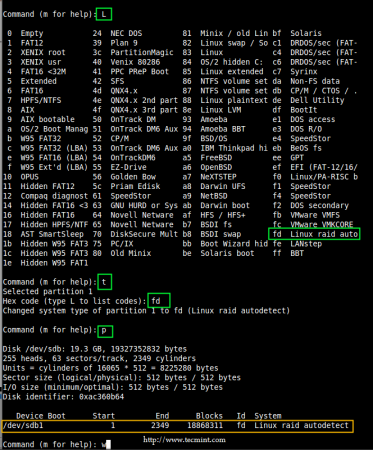 Follow below instructions for creating Linux raid auto on partitions. Type ‘t‘to choose the partitions. Note: Please follow same above instructions to create partition on sdc drive now. 5. 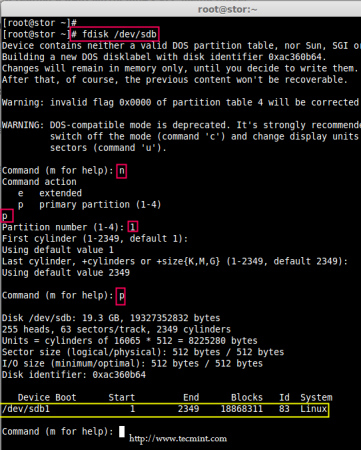 After creating partitions, verify both the drivers are correctly defined for RAID using following command. 6. Now create md device (i.e. /dev/md0) and apply raid level using below command. 7. Once md device has been created, now verify the status of RAID Level, Devices and Array used, with the help of following series of commands as shown. 8. Create a ext4 filesystem for a RAID device /dev/md0 and mount it under /dev/raid0. 9. 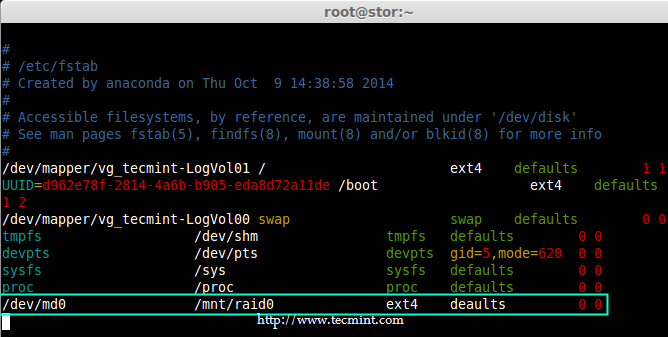 Once ext4 filesystem has been created for Raid device, now create a mount point directory (i.e. /mnt/raid0) and mount the device /dev/md0 under it. 10. 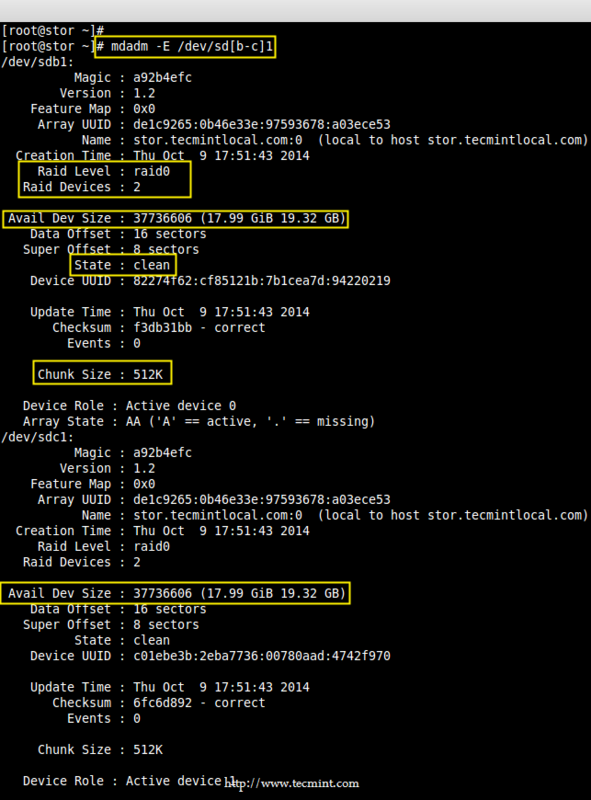 Next, verify that the device /dev/md0 is mounted under /mnt/raid0 directory using df command. 11. 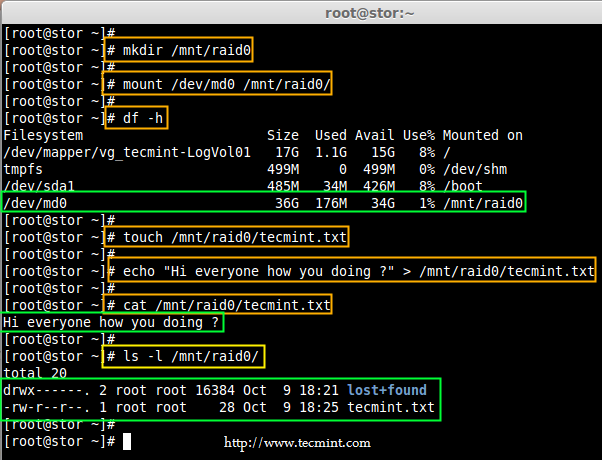 Next, create a file called ‘tecmint.txt‘ under the mount point /mnt/raid0, add some content to the created file and view the content of a file and directory. 12. Once you’ve verified mount points, it’s time to create an fstab entry in /etc/fstab file. Add the following entry as described. May vary according to your mount location and filesystem you using. 13. Run mount ‘-a‘ to check if there is any error in fstab entry. 14. Finally, save the raid configuration to one of the file to keep the configurations for future use. 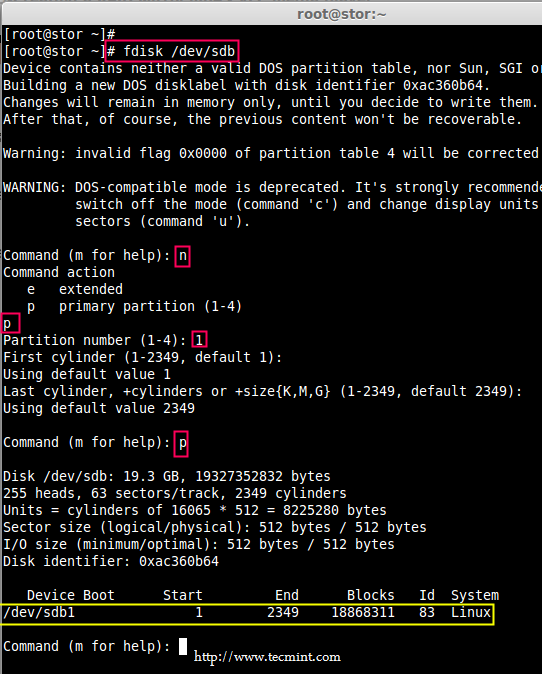 Again we use ‘mdadm’ command with ‘-s‘ (scan) and ‘-v‘ (verbose) options as shown. That’s it, we have seen here, how to configure RAID0 striping with raid levels by using two hard disks. 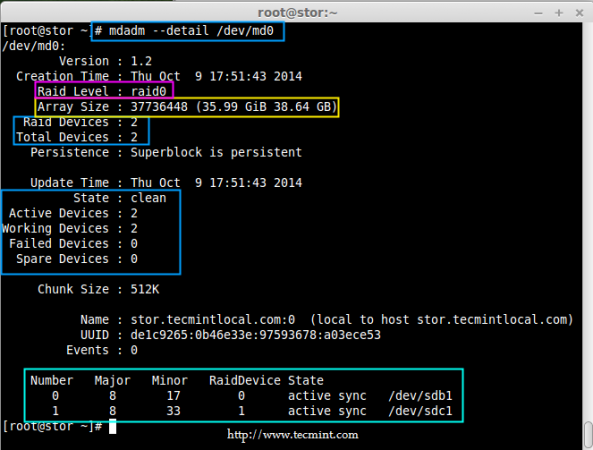 In next article, we will see how to setup RAID5. We are facing serious issue with RAID-0, we have created RAID-0 using your article in our Production environment. Now the scenario is our RAID-0 disks / mount point got 100% utilized and we want to extend the same RAID-0 volume. I have tried to extend the existing RAID-0 array by adding new disk to server. And uses your article Grow Raid Array in Linux to extend the RAID array, but it got failed and it converted existing RAID-0 to RAID-4 and gone in to inactive state. Also one of the existing disk got out of RAID-0 array and giving error “mdadm: /dev/md0 is not an active md array – aborting“. I do have error screenshot file. Please let me know on which email ID I should send to you. Important : Please help to learn us, how to extend existing RAID-0 array in Linux. Is it possible to monitor RAID0 failover events. I set-up RAID 0 on a test environment with 2 disks of 1 GB each. Then i removed one of the disk of the disk on a running system. But still I am able to work properly on my RAID 0 filesystem of 2 GB i.e. I am able to create a new file of 2GB. So id there there any other way by which whenever a RAID0 disk fails we can get an alert of corruption message while doing anything on filesystem. Thanks in advance…..Waiting for your reply.. Yes, we can setup an email alert as below. This will trigger the email when an error or failure in array md0. then i am getting an e-mail in my mail box. Thanks for this. I stumbled through countless write ups and reference material before reaching your article. I was able to spin up my secondary RAID 0 caching array easily while following your guide. Thanks for pointing out that error, we’ve corrected in the writeup.. I was able to follow up to step 6. There wasn’t any /etc/mdadm.conf file so I created one, but I couldn’t save the config. Please advice on how I can troubleshoot. Use root user to create mdadm.conf file..
vagrant user not in sudo (wheel) group, use root user to perform every steps. mdadm.conf will not be there we have to create one to save the config. Remove the partition and recreate it. Please go through other RAID topics you will find the solution which i have provided in comments. have followed your steps in my Vm , works good, But after i reboot my Vm everything is gone (Including Raid also ) !!! Fstab entry also i did . @Raghu adding fstab entry is not enough, you need to save the raid configuration using below command. Pretty sure you have not done the below steps so only you have lost the RAID after a restart.